Tonight, an after dinner walk turned into an adventure. The plan was to walk up and down Lothrop Street which is along the coast here in Beverly, MA, and is lined with beautiful big houses with ocean-side backyards. While I was parking the car in a little pocket park off of Lothrop Street, I could already see that the tide was extremely low. 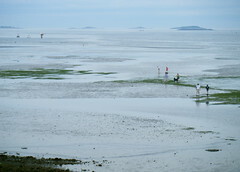 People and their dogs were walking way out on the sand bars exposed by the low tide. So we changed our plan and instead of walking along Lothrop Street as we had planned, we walked towards the ocean, following the stairs to the base of this little seaside park and then down another stone staircase to a very rocky beach. This is one of the first pictures I took, and if you look carefully, you can see the people and their dogs enjoying low tide, walking on sand bars very far out from shore.